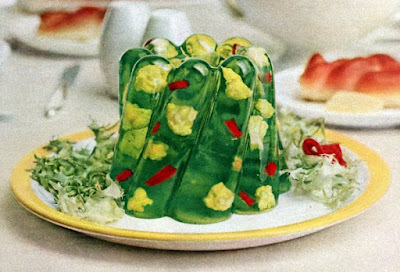 Jared Unzipped: Really Funky Retro Jell-O Recipes. 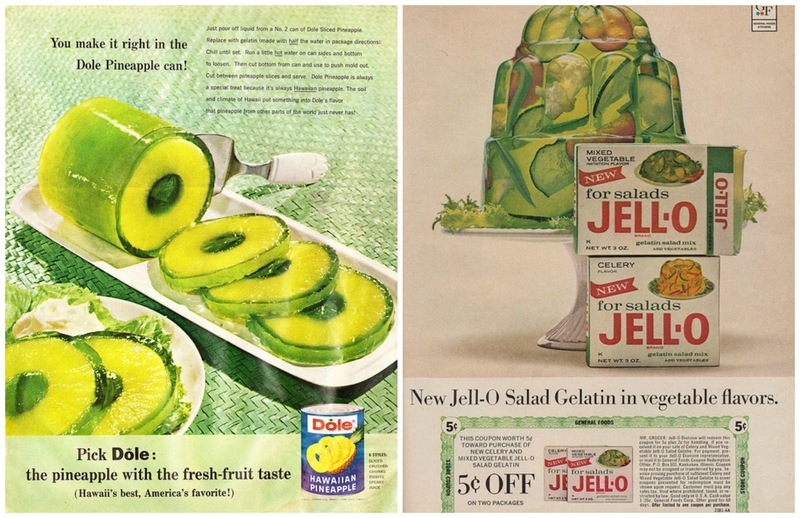 Up until the 1950's, Jell-O gelatin was more than just a tasty dessert. Jell-O also wanted you to eat their product for dinner. Yuck! After scouring the internet, I found some of the grossest Jell-O meals I never knew existed. Who can believe folks used to eat this stuff? 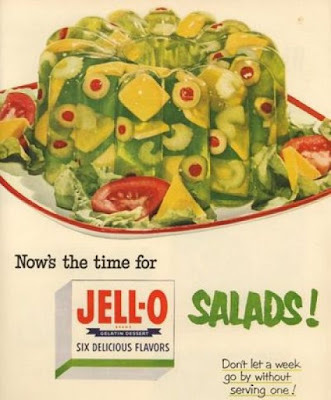 I mean, I love Jell-O, but not as a savory meal. Prepare to be nauseated! 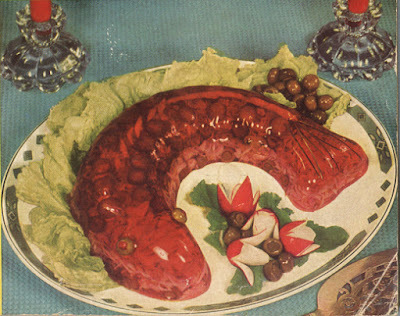 This is a fish-flavored Jell-O dish comprised of green olives, tuna, mackerel and radishes. The catch of the day looks a bit spoiled. 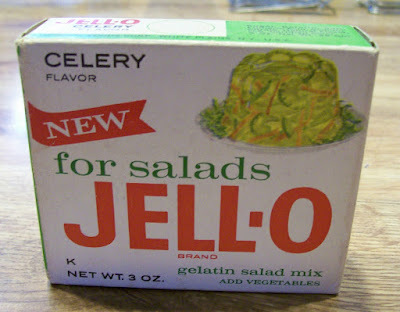 When I think of tasty Jell-O flavors, celery is obviously at the top of my list, right next to cherry and vomit. Here's one of the various uses for the aforementioned celery flavor -- you can mix it with tomatoes, green peppers and cauliflower. I can feel my stomach churning. You could also get Jell-O in a mixed vegetable flavor. Mmmm...! Oh look, it's like someone took a house salad and encased it in Jell-O... because they did. And perhaps the grossest of all, a 'lime cheese salad' used to present a seafood salad. It even comes with cottage cheese to make the recipe perfect. Separately, I like cottage cheese and seafood salad. 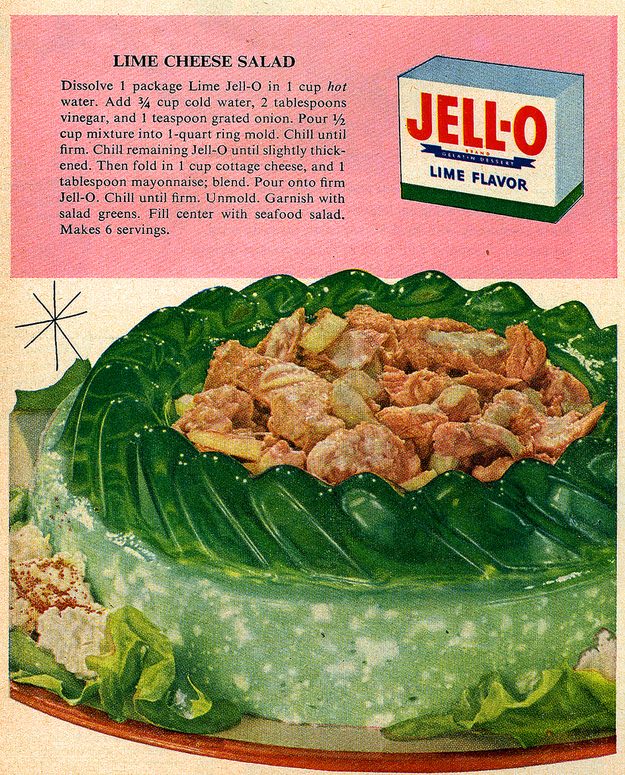 But wrapped in lime jello, vinegar and onions? I'm going to barf everywhere.